Or a suburban girl’s first brush with the law. Author’s note: When your boyfriend borrows your car and promises to bring it back on time to drive you to campus for your morning class and then doesn’t show up the next morning, you should be slightly suspicious. But I am not hardwired for suspicion, so I assumed he overslept, berated him accordingly and moved on. When, several weeks later, same said boyfriend is awake at eight o’clock in the morning (about 8 hours earlier than his usual wake-up time) AND wearing a shirt and tie, your suspicion should increase exponentially – especially when the only clothes you ever see him in are his Taco Bell uniform or a Marvin the Martian t-shirt and threadbare canvas shorts. But again, I was not hardwired for suspicion. Well, let’s just say that I was surprised by the above turn of events and leave it at that. Which is how, in 1993, when I was twenty, I found myself spending one day a week for six weeks sitting in a hard plastic chair outside the office of my baby daddy’s (did I mention I was eight months pregnant at the time?) PO – that’s probation officer for those uninitiated in the parlance of the street. I sat along the wall with all the other pregnant girlfriends waiting for their respective baby daddies to get done with their PO visits. Black, brown and white teenage girls with sculpted hair, over-sized hoop earrings and tight, low-cut Hot Topic dresses stretched over their ballooning bellies. Many with toddlers already at their feet. Their heavy makeup and defiant jawlines like armor – each a pubescent Artemis, Greek goddess of the hunt – wielding a baby bottle full of Kool-Aid rather than a bow and arrow. With impressive alacrity they alternately smacked and soothed whining kids and changed soiled diapers – all the while reapplying thick coats of black eyeliner and adjusting their push-up bras. They seemed to both command and decry attention simultaneously – leaving the mostly male, mostly middle-aged deputies in the room searching for a focal point that didn’t include a pair of underage breasts spilling out of the top of a tube dress. 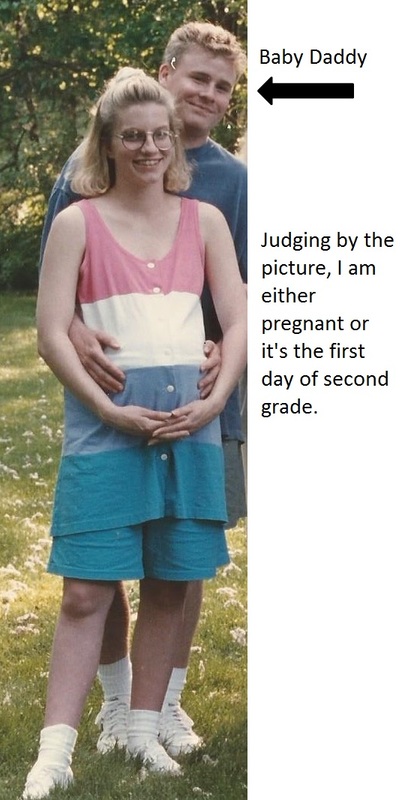 Then there was me, in my wide-striped pink, blue and white matching maternity top and shorts, white ankle socks and Keds, short blond bob held back from my face by a scrunchie. One of these things was not like the other. Emotionally (and via a rapidly growing fetus) attached to a man-child struggling to fully embrace adulthood and with somewhat questionable decision-making skills? Yet, while the other girls faced their weekly waits with equal parts cultivated apathy and warrior-like defiance, I found myself feeling not unlike Alice deposited in Wonderland – grappling with a deeply ingrained and rapidly disintegrating belief that the world, which had been a predictable and orderly place, was actually not either of those things. In truth, while I am sure that there were a myriad of socio-economic issues that would have divided us; the only obvious thing that separated me from these girls – besides my inability to wear underwire – was my disbelief at my newfound proximity to the criminal justice system. Call this the suburban girl’s dilemma. I had been raised to believe that my life would follow a set trajectory. That trajectory most definitely did not involve court-ordered drug tests, mandated weekly visits with district court employees or watching the father of my unborn child pile into a van in an orange jumpsuit and reflective vest with a dozen or so other unfortunate “low-level” drug offenders to pick up garbage along the expressway. And, while I hope with every fiber of my being that the other girls with whom I shared a weekly sojourn in this antechamber of poor choices didn’t include any of the above in their life trajectories either, I suspect, based on their conversations with one another, that they were less surprised than I was to find themselves a cog in the wheel of a mind-numbingly irrational criminal justice system. I am all for personal responsibility and keeping public spaces clean, but I could write an entire discourse on the sanity, or lack thereof, of charging fines that far exceed a person’s ability to pay, and then, when that person is inevitably unable to pay, adding additional fines or jail time as further punishment. Immediately you are creating a system where those with the money to pay fines for misdemeanor offenses get to continue on with their everyday lives with little or no inconvenience, and those that can’t become an even greater burden to an already overburdened social welfare system – and face much more devastating personal consequences as a result. That is a crime. Like Alice’s trip to Wonderland, my sojourn tripping the light fantastic at the Livonia Department of Probation was brief. My baby daddy finished his probation, paid his debt to society, married this baby mama, had two more kids and is now in his twenty-first year of wedded bliss. Hey – my story, my adjectives. And those girls that I encountered ever so briefly twenty years ago? I hope that any similarities in our lives didn’t end with our time spent outside the PO office, standing by our men. Then again, sometimes it’s hard to be a woman.